Why had the drains blocked? When I used to cook with oil, butter, ghee and animal products, it was almost impossible to thoroughly wash the dishes without using hot water and lots of Fairy Liquid – what I’ve come to call “Furry Liquid”. There was no other way of ensuring that all the grease stuck to pans, plates and cutlery would disappear down the plug hole. It was a particularly difficult job when trying to clean up frying pans and oven roasting dishes. But all of this changed when I cooked only plant foods and stopped using all types of oil. 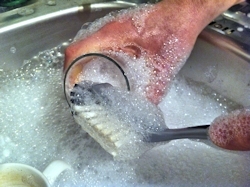 Suddenly I realised that I could wash almost all the dishes without washing-up liquid. Indeed, I even didn’t need to use hot water most of the time. The realisation then hit me that the fat on dirty dishes was the same fat that was lining my arteries and probably leading me to an early and unpleasant death. 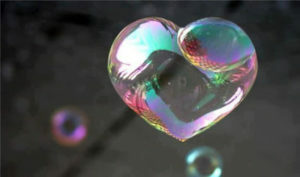 And it’s hard to find anything that has been in contact with processed food that isn’t covered with a lipid layer – fish and chips wrappers, pizza boxes, Chinese/Indian takeaway trays, burger boxes, and pretty much every empty plate you see in restaurants or on the dining table in our homes – regardless of whether its a fried delight or an oily salad. 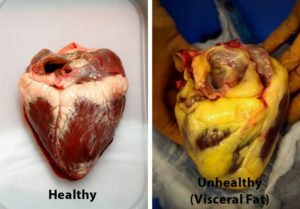 Nowadays, when I see people eating fatty foods or foods cooked in oil, I can’t help but imagine what their hearts look like. We once owned a building that had an underground garage. Next door was a classy-looking Indian restaurant. One Monday morning we opened the garage door to find that there was a 5-10 cm thick layer of the most disgusting fatty substance covering the whole of the double garage floor. 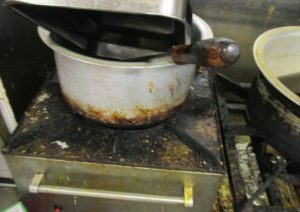 We eventually realised that the drains had become blocked because of the colossal quantity of ghee, butter and oils that the Indian restaurant had been flushing down the drains. This monstrous stuff had nowhere else to go except to push its way up through the manhole covers and into our now stinky and sticky garage. 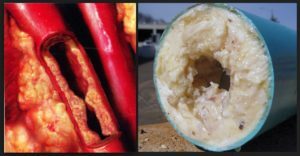 Looking at a section through the blocked underground drain is not so dissimilar from looking at a blocked human blood vessel. When we popped next door to ask them if they could possibly do something about the mess their oily waste had made of our garage, we were able to have a quick glance behind the tasty front of house veneer at the rather less tasty kitchens, hidden at the back of the restaurant. It was shocking to think about the quantities of fat the Indian restaurant must have been spewing into the sewers – let alone what the diners had been stuffing into their bodies. But my family had been doing pretty much the same in our own kitchen for years, albeit on a much smaller scale. I recall my father having to clear clumps of fat from our drains when they became blocked. Fish and chips on Friday, bacon and eggs for breakfast, roast beef, chicken and lamb on Sundays. It’s no wonder that both my parents had sky-high cholesterol and various circulation problems. No wonder that I was pre-diabetic before adopting a WFPB diet. 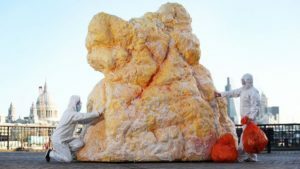 Did you ever hear about the 2013 East London Fatberg1? This was a massive accumulation of cooking oils that people just like us had been pouring into the sewers. 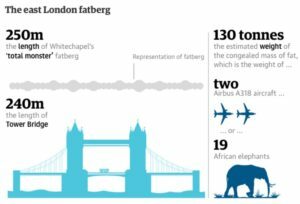 It weighed the same as 11 double-decker buses and it stretched the length of two football pitches. The congealed mass of fat, wet wipes and nappies was one of the biggest ever found. Working seven days a week for three weeks solid, the workmen had to use shovels and high-powered jets to break it up. Have a look on the pavements outside the next takeaway that you pass. The grease gets everywhere – on our shoes, clothes, hair, in our lungs and blood vessels – it even finds its way into the fabric of the pavements on which we walk. 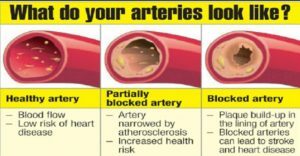 So do your dishes and blood vessels a favour – wipe out the oils before they wipe you out! 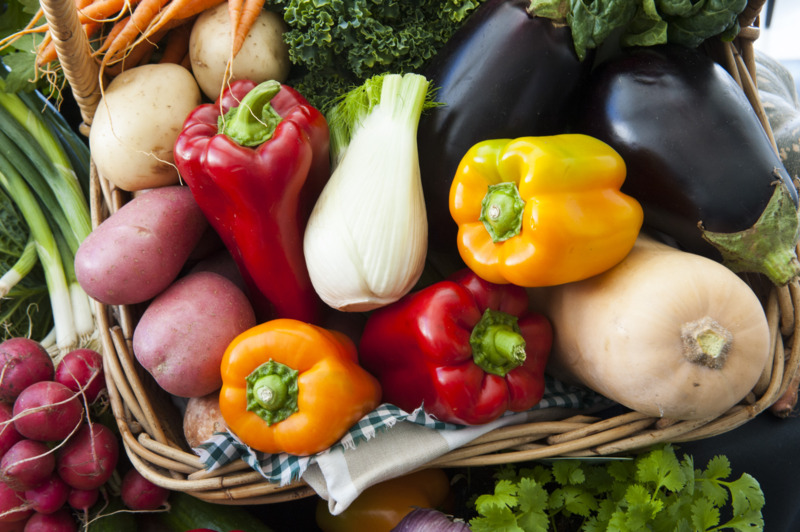 Next Next post: UK Medical Students to Get More Nutrition Training?